Its real.. not sure exactly what it is. I am guessing its a civilian medal given out in the early period, like 1928 to 1930s. 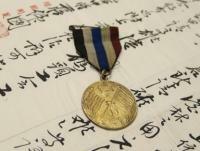 The manufacturer also makes other medals, such as the Cloud and Banner. I saw one recently, a 2nd class, shown below. Actually the back on the 4th class translates to "Silver Quality, 4th class, Medal" 銀質四等獎章 The 2nd class translates to "Gold Quality, 2nd class, Medal" 金質二等獎章 Correct me if I am wrong... Maybe class 1-3 is gold, 4-6 is silver, and 7-9 is bronze? On the obverse, 員會, means member. That is what I can tell so far.. The cloth is pictured on the wrong side. I am sure the ink would be easier to read on the other side. Here is another class. It is a blue version. Enlisted visors are harder to find. Enlisted do not have silk lining and has a tag to write name with a different lining. Visors are different by the material used too. Saw this a few weeks ago and noticed the size was 7.5 cm. Did they come this small? Hi Wendell, thanks for the information! I assume the medal was lost long ago? Anybody know if Special Breast Order is what class? I am guessing 8th or 9th? Good observations.. I know there are really bad fakes, but either could be real or genuine, not to sure..
Also, get a medal bar. From what I can tell, I don't see a strings to attach medals though. Thanks for the information. Good to know. Seems confusing a bit, but I understand what they are for now. I never understood how they arranged their ribbon bars or the medals that they represent. I think there is somewhat of a pattern, but not really? It seems that every one I see, it looks all the same medals being awarded (multiple times).